After taking pictures of the City of Prineville Railroad engine 989, I said goodbye to Bob Riskie who decided a month ago not to take the trip and boarded the Crooked River Dinner Train. All the workers on the train were dressed for "The Defense of Jesse James" program they would present tonight during our three hour trip. I walked through the train to Table Car 1. On my table I found a pamphlet called "The Jesse James Gang" presents "In Defense of Jesse James". I was joined at my table by Margaret and Jim Taylor of Vancouver Island, Canada who would be dining with me tonight. They had ridden the train twice before. While we sat and waited for departure a BNSF southbound freight blasted through Prineville Junction. It also started to rain and continued to do so until well after we left. 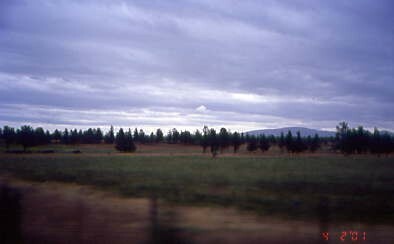 This railroad is unique that it is owned entirely by the City of Prineville. It is also the oldest continuously operated municipal owned railroad in the United States. The line was built in 1916 as a connection to the jointly owned Oregon Trunk/Union Pacific Railroads. Neither railroad had any intention on building into one of the oldest cities in Central Oregon as they did not think it was on a good route. The City Fathers felt that the town would die without a rail connection to the outside world and took matters into their own hands in 1911 when they incorporated the Prineville and Eastern Railroad. The 19 mile railroad was built with the use of city funds in 1916 to 1917. The junction with the Class One Railroads is at Prineville Junction. Traffic was slow to develop in the early years and in the 1930's the city even defaulted on its bonds. Just before World War Two began passenger service was dropped as residents used cars and buses for travel. Tracks were then upgraded to allow heavier loads as freight and lumber mills increased their production in the Prineville area. In the 1950's and 1960's rail traffic was so high that the Prineville had one of the lowest tax rates of any city due to the revenue from the railroad. Today the City of Prineville operates three locomotives with one assigned to the Crooked River Dinner Train which is privately operated with the COP supplying engine and crew. This railroad is also home to the Mt Emily Shay Locomotive owned by the Oregon Historical Society. Traffic includes lumber and forest related products, wheat, phosphoric acid and general commodities. 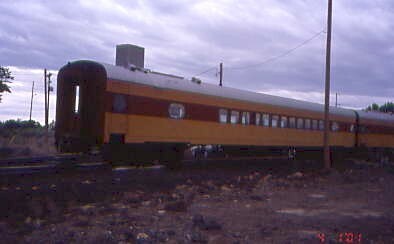 The Crooked River Dinner Train was started in 1991 by owner Stephen Wright. 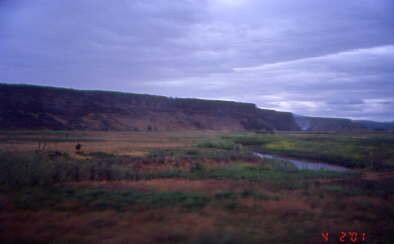 He called his train the "Strawberry Desert Train" for the 38 mile round trip through the beautiful Crooked River Valley. The full service five course dinner was began on June 29th, 1991. It was soon followed by Sunday Champagne Brunch and Excursion Trains. Next came the first Murder Mystery called the "Mystery of the Last Dinner". 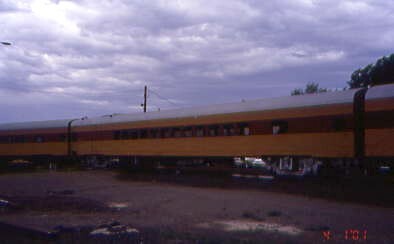 After passengers ate, they went to a 1949 boxcar to see the Mystery. The next season the Crooked River Roundup did the first train robbery on the Sunday Brunch Train to promote the Crook County Fair. 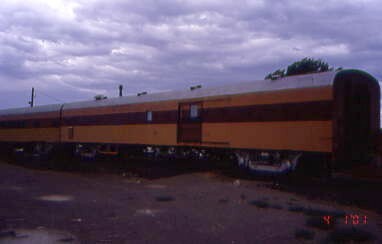 In November of 1994, Pat and Joann Daly bought the train and under their guidance the operation was in the black by 1996. They acquired their own staff, got a liquor license and started the interaction murder mystery the line became famous for. The first play, "The James Gang Rides Again" was written by Teri Hisaw based on the true facts of Jesse James with a few fiction and fictional characters. The Sunday Champagne Brunch became the Sunday Supper with a Wild West Jesse James Robbery taking place on each trip. By 1997 the Crooked River Dinner Train had become Central Oregon's 1 Year Round Attraction and became known as the Jesse James Train. In the summer of 1999 a mobile kitchen was added to the property which made the operation of catering the food trouble free. 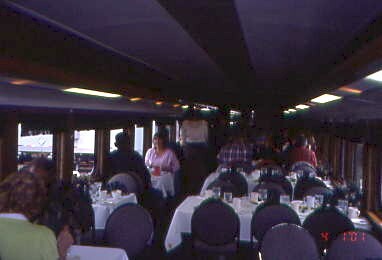 The food is cooked right next to the train and 15 minutes before the passengers arrive the food is brought on board hot and ready to be served during the trip. 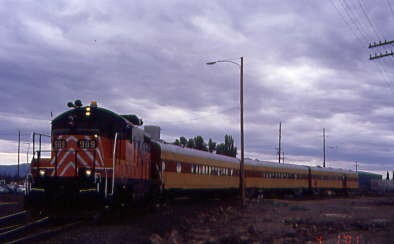 On December 23, 2004 the City of Prineville purchased the Crooked River Dinner Train and continues to run great trips serving thousands of passengers each year. Power for our train was City of Prineville 989. The Gift/Crew Car is the car you board the train and get your seat assignment. The inside of my Table Car 2. All of these cars are ex Milwaukee Road. Drink orders were taken and I just enjoyed water since there was plenty of it falling outside of our train while we were waiting for any late comers. Outside of the train a bank robber was going to rob the train. He got shot by someone aboard but we do not know who. The conductor dragged his dead body aboard our train. 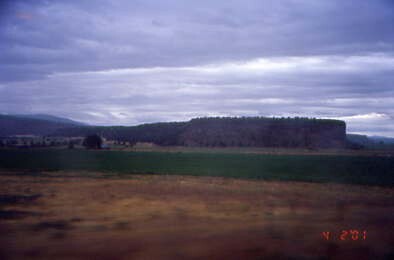 We departed Prineville Junction at 7:00 PM departure by backing up south past the switch that would take us to Prineville. 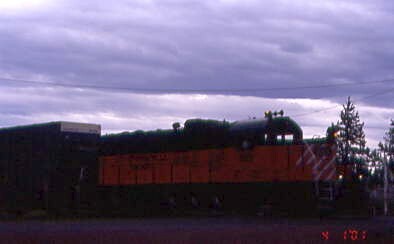 The train headed east through the City of Prineville Railroad yard. We passed a house with real nice stone fencing on the right giving it a distinct look. 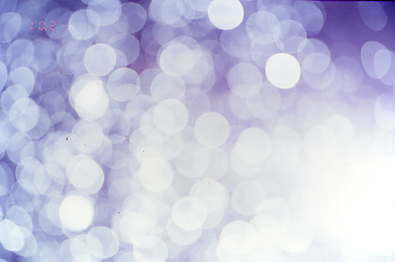 With the window covered with raindrops I tried this picture as I always wondered about what it would look like. Now we know. Our route took us by ranches with cows and fields which had deer grazing. Salads were passed out to the passengers. A junk yard was off to the left. 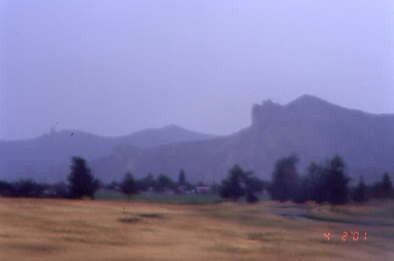 Smith Rock which is a major rock climbing paradise off to the left. As the train curved off to the right we crossed an aqueduct before running along the backside of a ridge. 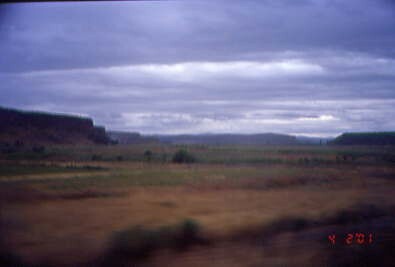 A really beautiful valley came into view to the northeast and the highway to Prineville came into view from the south. Ballast Cliffs overlooked the green valley floor. The Crooked River came in view as we traveled through the valley. Wild mustard plants graced our path along this part of our journey. More of the evening performance was played out after the dinner rolls were disturbed. Later a flume ran along the cliff to our right. More Ballast Cliffs and green valley vistas along our route. The Crooked River took a bend before we entered the Prineville Valley. Our train climbed a grade and over a highway to reach the next plateau where Prineville is located. We passed a former lumber company on our north side before we passed another lumber mill producing lumber with no rail activity. At Prineville we passed the active lumber mill with cars being loaded as my Prime Rib Dinner was served and it was delicious. Another part of our Jesse James story is acted out before we pulled up near the City of Prineville Railroad engine house. Locomotive 1837 was sitting outside in the early evening fresh air. Now the cast of characters sang a few songs with one called "Someone Robbed the Prineville Train". More songs and we all sang "Home on the Range" with the cast with passengers doing hand signs. 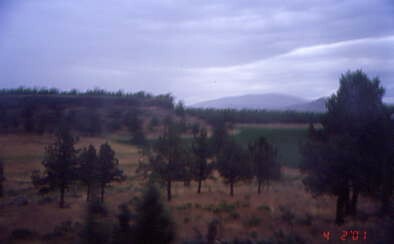 Our power cut off the train and ran on a balloon track through the mill and then went to the front of our train for the trip back to Prineville Junction. We left Prineville at 8:35 PM as Cheesecake was served for dessert. Another great job of acting was done further adding details to our story. The rain continued as we headed back with more of the skit and more singing taking place. We all wrote on a piece of paper on our tables who we thought did the murder. Who dun it? I will not tell you, just come ride this fun dinner train and find out for yourself. Everyone settled their bills and all passengers celebrating special occasions were noted. I bought a Crooked River Dinner Train T-shirt. We arrived back at Prineville Junction at 9:44 PM ending an excellent trip on the Crooked River Dinner Train. 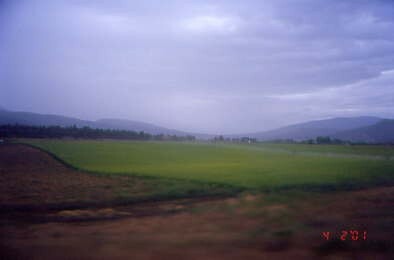 Bob was waiting in the parking lot with the car gassed up and he drove back to almost The Dalles. I took over for the rest of the trip back to Portland hitting some rain showers in the west end of the Columbia River Gorge. We arrived back at the Days Inn at 1:02 AM for a very short night of sleep before my last NRHS 2005 Convention Trip later this morning.